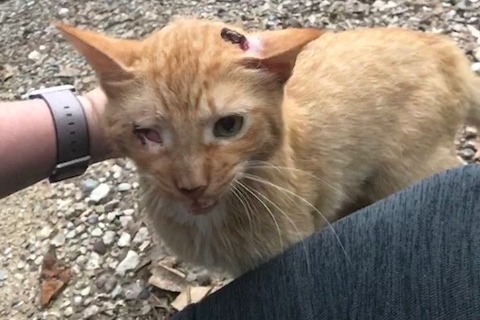 Fundraiser by Amanda Jones : Will the cat needs your help! Will the cat needs your help! Here's the short version: Will is a loving stray who came into our lives after being hit by a car. 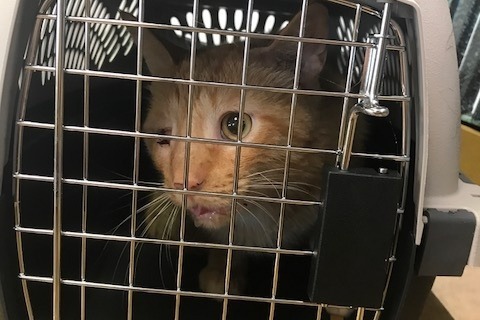 He's having surgery to remove an injured eye and repair a broken jaw, and we're looking for your help to cover the costs! Meet Will the cat! Will is a sweet stray who showed up at our house on June 8th after being hit by a car. He was too skittish to let anyone near him, but we could tell that at least his eye had been injured. 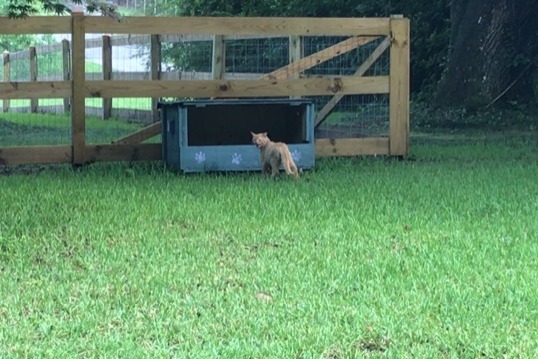 We get a lot of thunderstorms this time of year, so we built him a feeding shelter where he could have fresh food and water out of the elements. 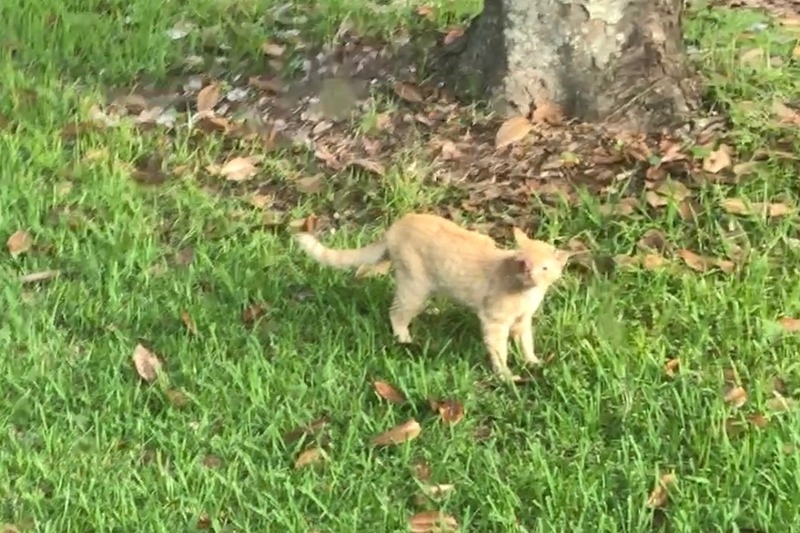 After about a week of cautious watching, he finally approached us on Saturday June 16th, and seemed to go from being scared to demanding pets in a heartbeat. I never would have expected him to be so sweet and friendly, but you could tell he's been missing love and attention. 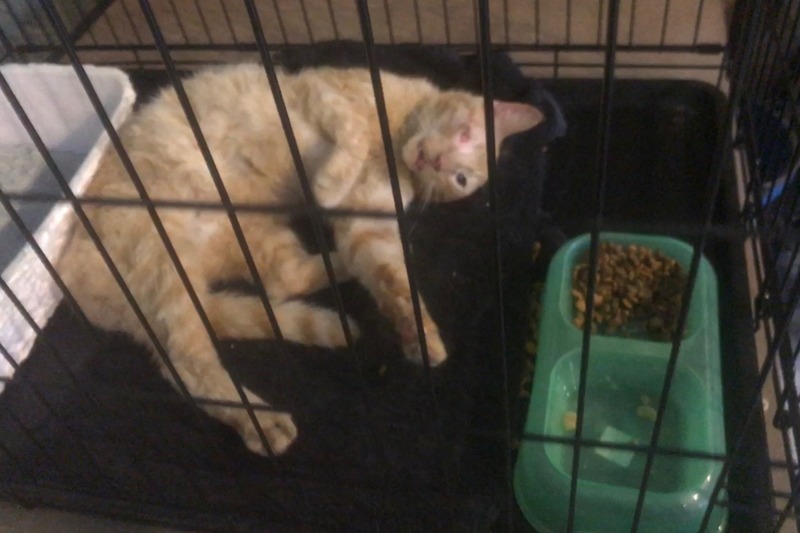 We set him up a crate in the garage where he'd be away from our other pets but still have shelter and some cool air blowing. He spent the weekend content in the crate, enjoying frequent meals and belly scratches, with no apparent interest in leaving or being anywhere else. Unfortunately, it became clear that he also had an injury to his jaw that was making it impossible to close his mouth completely, causing him to drool constantly and struggle to eat. 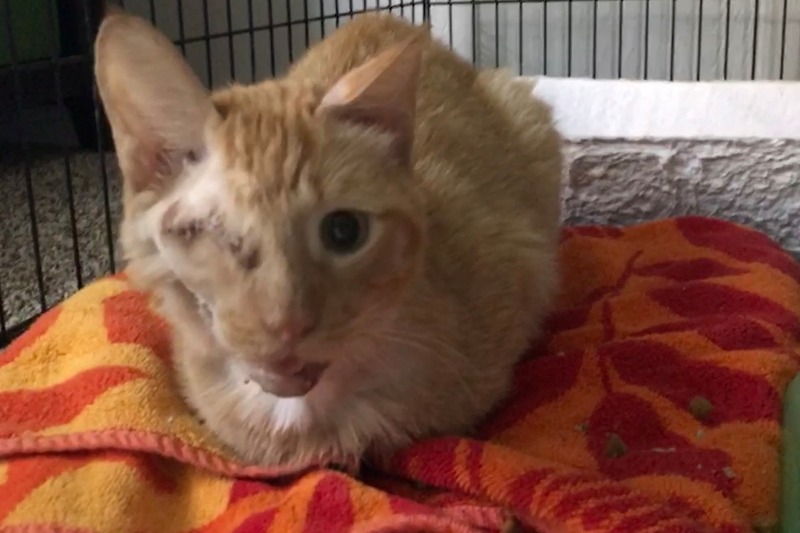 We brought him to the vet on Tuesday, and he confirmed that Will's eye would need to be removed, and that his jaw was severely broken and would need to be wired. To do nothing for him wasn't an option at that point--he might survive on his own for a while, but he was prone to both infection and malnutrition considering his injuries, and there was no way we could leave him like that. The vet told us that with injuries like his, some people would opt for euthanasia, but watching the vet tech scratch Will's belly while he wiggled happily on the exam table in spite of everything, that didn't seem possible either. 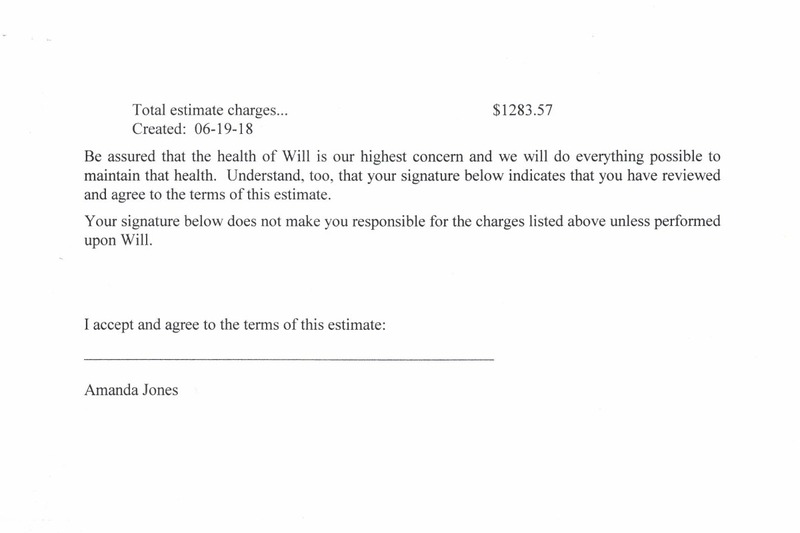 Surgery for Will won't be cheap, although our veterinarian was moved enough by Will's charming personality and sad story to give us as affordable an estimate as possible. Still, we're looking at $1,000-$1,500 to get him fixed up and healthy enough to come home. 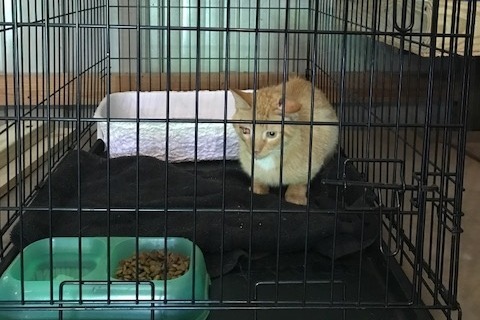 That's a large and unexpected expense, and we discussed our options, but we knew what the outcome was going to be from the moment he showed up outside our window two weeks ago: We're going to get him healthy and give him a safe home no matter what. We're reaching out to friends and anybody who's able to defray the costs. If you can help us cover the costs of Will's surgery and medical care, we'd be incredibly grateful, and I know that he will too. 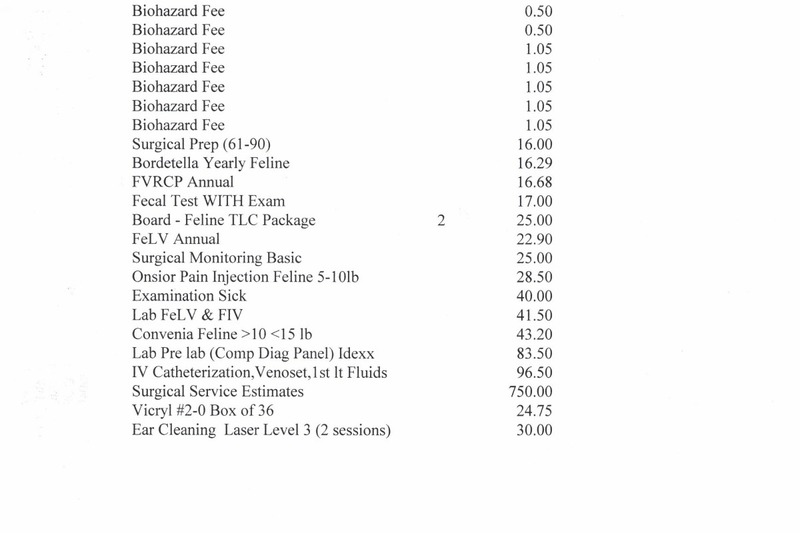 A copy of our vet's estimate is included below--the amount might change depending on how the surgery goes, but our current estimate is $1,283.57. We just reached our goal, and I'm absolutely floored. Will came home tonight, and he's resting and eating and already seems ready to explore the whole house--he definitely doesn't think it's fair that he has to be cooped up for "recovering" or "adjusting" or anything silly like that. The vet wants to see him back next week to check to see how his jaw is healing, but overall seemed to think he was going to be just fine. His jaw might be a little wonky, but he'll be able to eat and meow and anything else important. 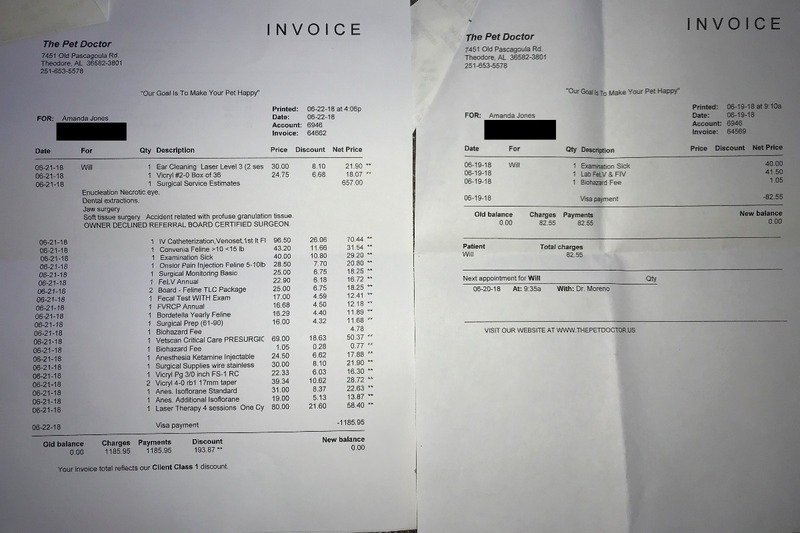 I'm including pictures of both of our vet bills; one for the initial visit where he was examined and tested for feline leukemia and FIV, and one for the surgery and associated expenses as well as his vaccinations. 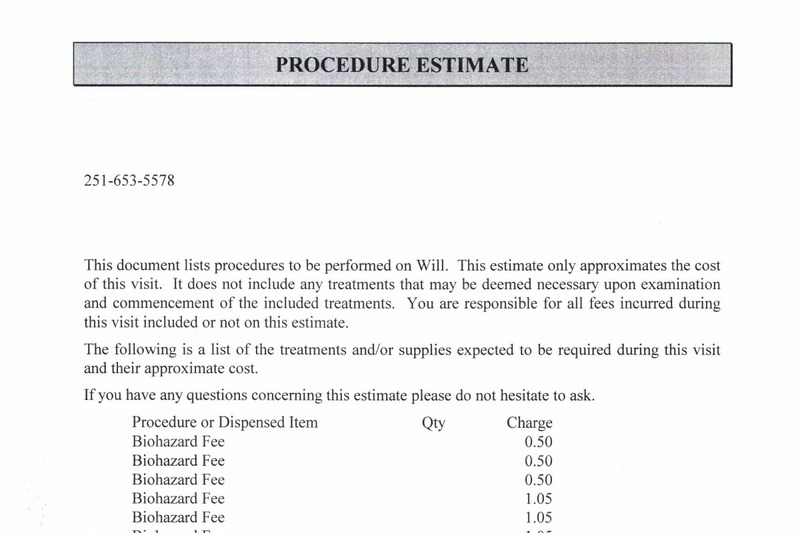 It totals $1,268.50, which is just a bit less than the original estimate. We already loved our vet, but he really outdid himself with looking out for Will. The money that this campaign has raised is going directly toward those bills, and everyone who has donated or shared has our deepest thanks. Will shows his thanks by poking his tongue out, but I promise it's sincere. If you've donated, I'd love it if you'd message me with your mailing address so I can send out some notes of our appreciation. I'll update again once he's a little further in his recovery, but most likely you'll be seeing him on social media in the meantime. Thank you all so much for your support. I just spoke to the vet, and Will is out of surgery and resting comfortably. They had some trouble with his jaw due to the extent of the injury, but he thinks his outlook is good and he'll have almost full function once he's healed up. They're keeping him overnight to keep an eye on him, and we should hear more tomorrow. Thanks so much for all the support you've given us--I'll keep you posted!